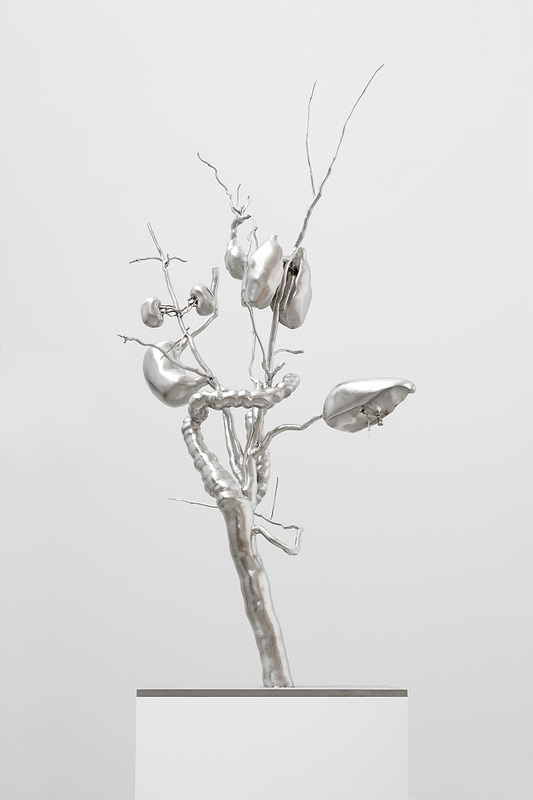 New York–based artist Roxy Paine has two series of artworks—both distinct and striking—on display at Paul Kasmin Gallery in Chelsea. 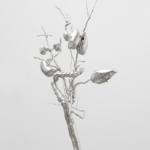 The first are the “Dendroids,” the latest iteration of a long-running group of all-stainless steel sculptures that meditate on how the industrial transforms into the natural. 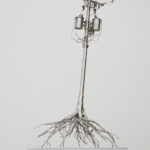 These gleaming artworks feature man-made objects, human organs, and other abstract forms seamlessly melded with trees. But the exhibition’s other trio of works—the “Dioramas,” titled experiment, Meeting, and Desolation Row—are even more surreal and provocative. experiment portrays one of the CIA’s “MKUltra” experiments, which lasted from the 1950s to 70s and had scientists observe the effects of LSD on subjects, sometimes without their permission and coupled with various forms psychological manipulation and torture. No photographs of these experiments exist, but Paine has crafted a vision here. 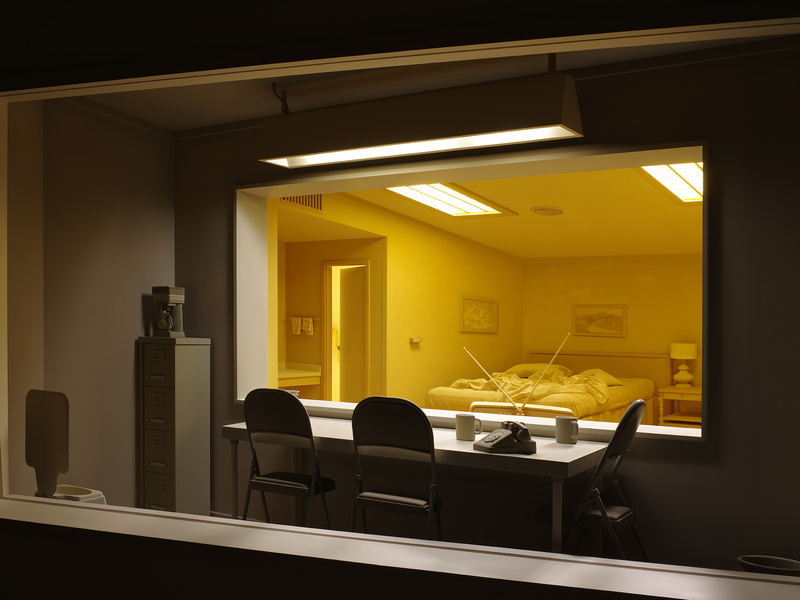 He situates the viewer in front of an MKUltra experiment, with a CIA observation room looking onto a testing area (a generic, hotel-like bedroom and bathroom). The former is dark gray, the latter all yellow. 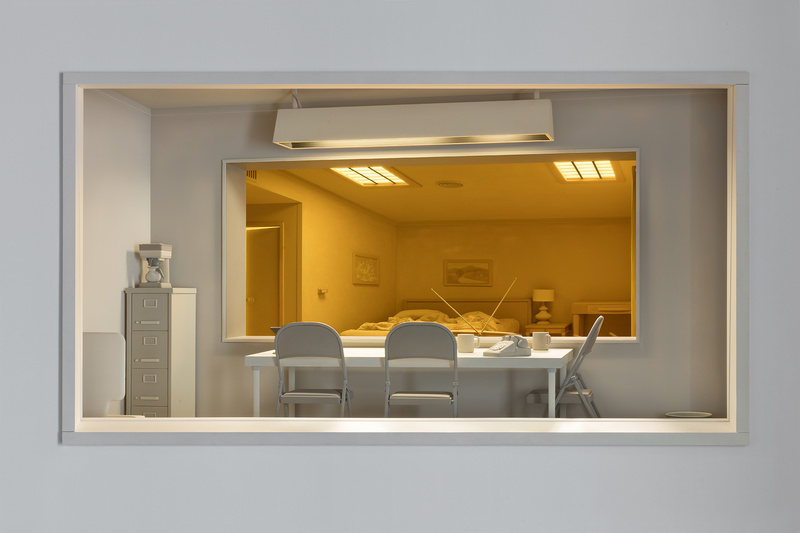 Most remarkably, an incredibly acute forced perspective compresses the two small rooms together. 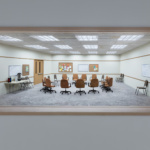 From a certain angle, the vanishing point and scale are flawless, but any slight movement reveals the extreme compression of the observation room furniture. 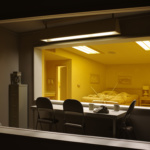 No glass separates the viewer from the two spaces, but the yellow hotel room feels miles away. The collapse of visual perception in experiment, combined with its subject matter, forces the viewer to confront paradoxes of perception, reality, and control, all to very chilling effect. Meeting is far more ghostly. 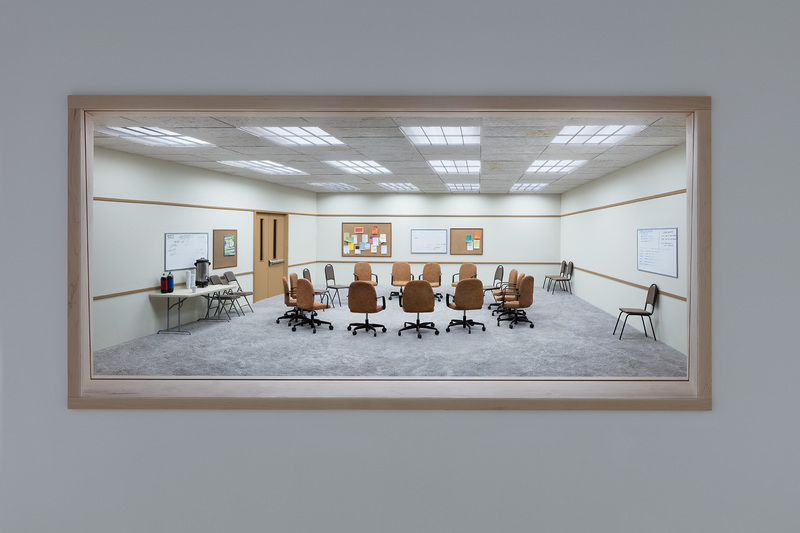 It depicts the windowless meeting room of a twelve-step substance abuse program; the diorama features models of generic office furniture and bright white fluorescent lighting. As with experiment, the forced perspective is flawless, but the diorama’s eye-level placement and realistic coloring heighten its strangeness. 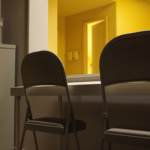 From afar, with its harsh fluorescent illumination, the room appears photo-realistic. 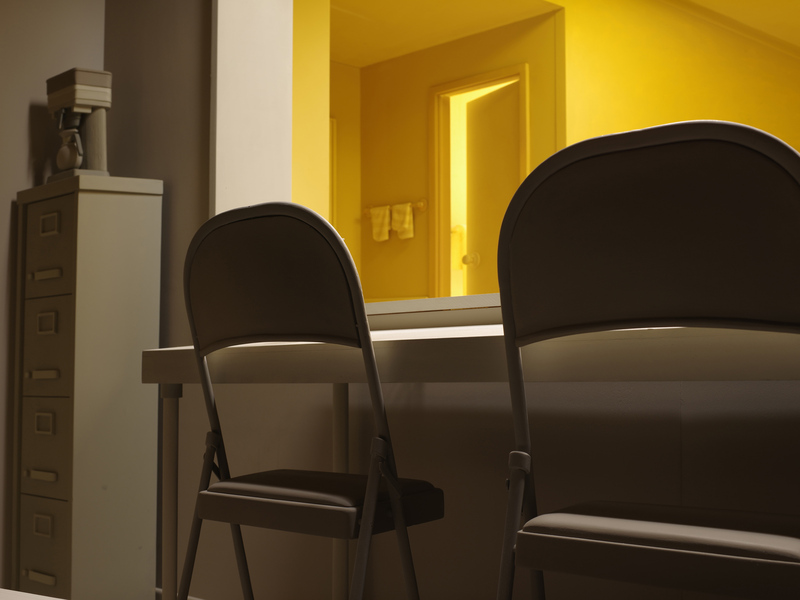 But as the diorama pulls you closer, rough and unfamiliar textures appear on the floor and chairs. As you approach the far corners, it appears as though the scene has been put under a fisheye lens. Unlike Meeting, there are no shadows. All these effects make experiment pass from surreality to almost nightmare. 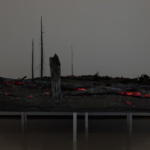 The last diorama is Desolation Row, which depicts a smoldering landscape of blackened earth and burnt trees, still glowing with orange light. There’s no use of forced perspective here—at least, none that I could see, though the diorama’s farther trees do shrink in scale. Desolation Row evokes a cycle of growth and destruction, as well as themes of control, man, and nature that run throughout all the exhibition’s artworks. Architects will certainly appreciate the care taken with these dioramas; Paine’s attention to detail and perspective is remarkable. 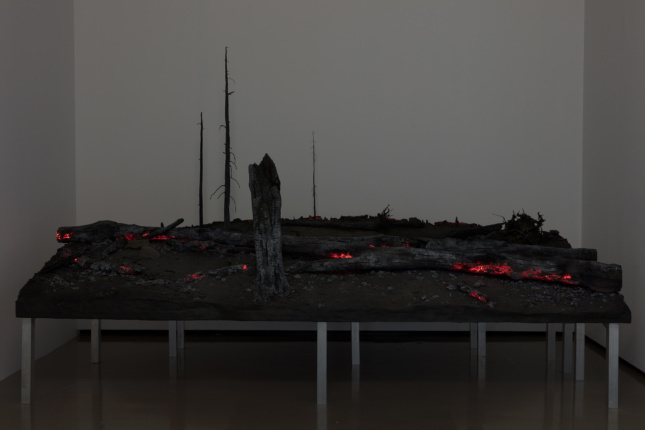 However, while architectural models aim to explain, elucidate, and convince, these do the opposite—they disturb, provoke, and question. 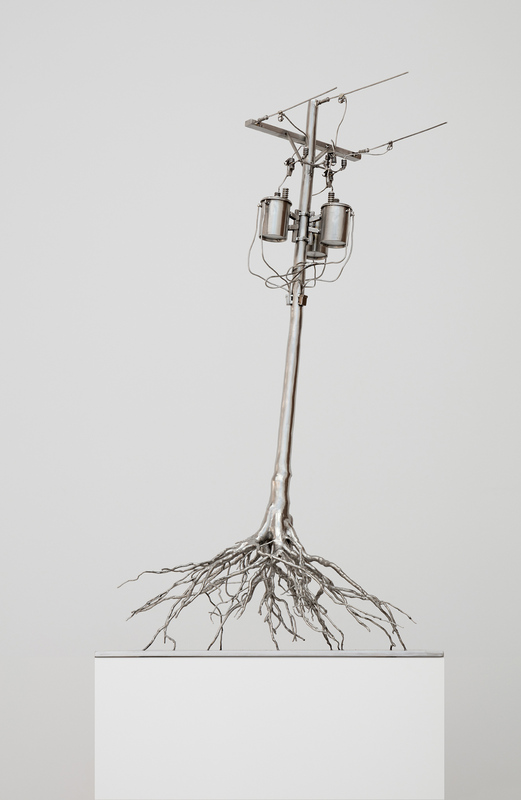 The show—titled Farewell Transmission—is on view at Paul Kasmin Gallery at 293 & 297 Tenth Avenue, New York City.